What Do Tron And The Fastest Car On Earth Have In Common? The Bugatti brand is responsible for the Bugatti Veyron, the fastest road-legal car on the planet. Former Bugatti employee Daniel Simon is responsible for the newly styled Tron: Legacy Light Cycles. 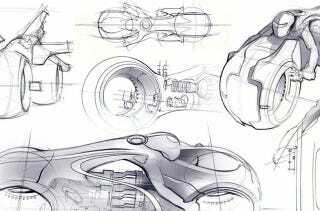 The original Light Cycles were designed by Syd Mead of Aliens and Blade Runner fame. Big shoes for the German designer to fill. Simon gained wider fame as a car futurist with 2007 book Cosmic Motors. "These designs wouldn't work in the real world," Simon tells the BBC. "They make total sense in the computer world. It's fantasy and it's entertaining." According to Motor Trend Magazine, no actual real-world prototypes of the Tron: Legacy vehicles exist. The closest to real-life versions of the Light Cycles were skeletal frames that actors could mount for specific shots. There are a handful of "custom built" Light Cycles, but these were produced by a Florida-based bike builder and not created for the film. Click through the gallery below for more of Simon's Tron work.